In some senses the world of information technology can sometimes resemble certain Olympic sports. Vendors from increasingly multifarious regions around the world compete for dollars of individuals and companies — call these customers judges, if you will. Governments would wear the referee stripes, setting the rules and enforcing them with fines, and stock markets are the bookies taking bets on the action. 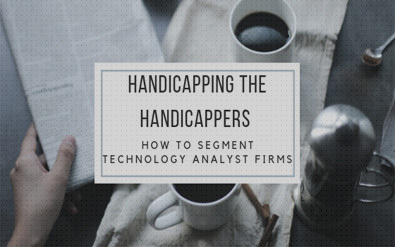 However, it’s a different set of stakeholders — one that is somewhat unique to the broader tech/telecom sector — that does the handicapping: industry analysts. These experts, many of whom are former tech industry players themselves — are paid to assess the IT sector as a whole, as well as the myriad individual technology and vertical market segments that make up the space. They evaluate the product roadmap, financial performance and overall vision of the individual players in their respective coverage areas. On the surface, it might seem that these theoretically independent analysts are like the broadcasters and pundits following every development in the game; they evaluate current trends and predict future ones, and form opinions on which companies can be considered leaders, up-and-comers and dark horses. Except, unlike the commentators of athletic contests, companies can pay industry analysts for their advice, or commission them for selected services, such as white papers, surveys and market research — the imprimatur of an ostensibly neutral party carries weight in sales meetings, in theory. In fact, a friend of mine who runs analyst relations for a hyperconverged infrastructure platform told me his company maintains paid relationships with four firms at any given time, give or take. Tech startups and midmarket companies may or may not need to shell out money for analysts’ paid services — and make no mistake, they aren’t cheap — but they cannot ignore these folks if they want to make a dent in their respective market segment. In our observation, firms generally fall into three broad categories: 1) the Goliaths, 2) the midsize players and 3) the specialists. These large firms cover just about every type of IT product or service under the sun, as well as the industries in which information technology is applied. They employ armadas of analysts to cover specific fine-grained technology categories, individual vertical markets or particular regions. Gartner, IDC, Forrester and, to a lesser extent, Ovum count many Global 1,000 companies and hundreds of smaller players as clients. Their reputation is sterling, and their research often significantly influences boardroom agendas. From an analyst relations (AR) perspective, anyone who is anyone in tech has to brief the appropriate analysts at least once a year, if not more, to ensure they are on these influencers’ radar. If you’re entertaining a paid relationship, you’ll be able to tap the army of a small country’s worth of experts who collectively carry a tremendous wealth of knowledge. The downside: For one, it’s expensive (some would say, obscenely so). What’s more, we’ve heard many clients over the years express feeling coerced, in a sense, to pay for Gartner’s services — clients and prospects interface with the firm, so vendors feel they can’t afford to be left out of the conversation. (One went as far as to refer to its Gartner relationship as a “shakedown.”) Unfortunately, since so many Global 1,000 companies and hundreds of other startups are also clients of these firms, these analysts tend not to provide as deeply personalized service. Furthermore, for all the money you spend with them, the steep fees only cover so much; you still need to pony up more dollars for select additional services. These general technology firms aren’t as big as the Goliaths, but they still have significant influence on many prospective customers and high credibility among journalists — research houses like Enterprise Strategy Group (ESG) and Enterprise Management Associates (EMA), among many others, are often quoted in the press. They also make great partners for joint research, surveys, white papers, independent product testing and other services that benefit from an analyst’s imprimatur. Big firms offer many of these services and arguably carry more weight with their brands, but the midsize firms can be more attentive to your needs and are often less expensive. In terms of educating these analysts without a paid relationship, the smaller staff sizes mean that each individual analyst covers multiple technology areas, many of which can be (and are, at large firms) a full-time job to follow in and of themselves. For example, we have worked with one analyst charged with overseeing everything related to data management, including databases, software apps and networking offerings. It’s no wonder that we had to start from scratch every time our client briefed this analyst, despite updating him every six to eight months; the analyst, in theory, has to keep the story of hundreds of vendors in his head. As is the case with many professions, advantages to being a jack-of-all-trades are often offset by being a master of none. These firms combine the smaller size and personalized service of the midsize firms with the granular focus of the individual analysts at the larger ones. A company might focus on a particular technology like storage or a larger category such as the Internet of Things. Or they might specialize in how technology fits in a particular vertical industry. Although these firms don’t appear in the press as often as their large and midsize counterparts, they and their research still get cited by journalists every now and then. Most important, these firms tend to approach their work from the perspective of solving larger business problems rather than focusing on technology itself. Specialization is difficult to sustain in technology in the long term. The latest buzzword becomes the next passing fad remarkably quickly. (Cleantech, where have you gone?) Technology also becomes commoditized before you know it, which forces these firms to reinvent themselves. Or the specialty firm does so well, it gets acquired by one of the heavyweight generalist firms. Any company that wants to make noise in the technology space should take the time and effort to cultivate relationships with the firms in all three of these segments, even if they are unpaid. At the end of the day, they need to know you as much as you need to know them.